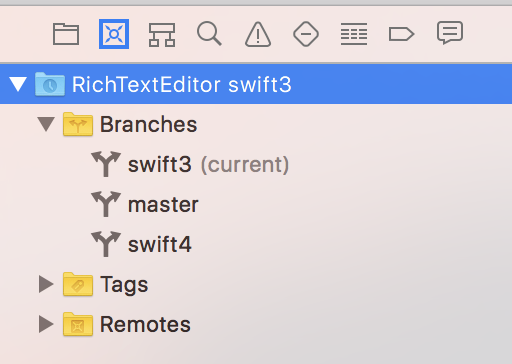 Xcode moved the branching version control operations to the source control navigator, whose button is next to the project navigator. The source control navigator shows your local branches, tags, and remote branches. Selecting a branch shows the commit history for the branch. Double-clicking a commit shows the changes you made in that commit. Select a commit, right-click, and choose Checkout to revert your repository to that commit. To create a new branch, select the branch where you want to base the new branch, right-click, and choose Branch from. A sheet will open for you to name the branch. To switch to a branch, select the branch, right-click, and choose Checkout. To create a tag, select a branch, right-click, and choose Tag. A sheet will open for you to name the tag and supply a tag message. To delete a branch, select it, right-click, and choose Delete. You cannot delete the current branch. Merging branches involves a branch you select from the source control navigator and the current branch. Select a branch that’s not the current branch and right-click. The contextual menu that opens has items to merge the selected branch into the current branch and merge the current branch into the selected branch.